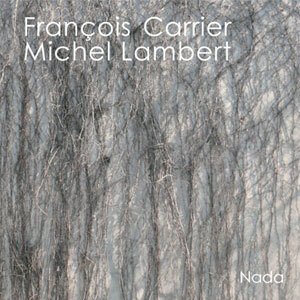 For their third duo recording Nada, Canadian saxophonist François Carrier and drummer Michel Lambert, play no less than twenty short improvised pieces, varying between 44 seconds and 6 minutes. In stark contrast to most other releases by Creative Sources, the music in Nada is relatively accessible, there is melody and rhythm, even implicitly, as opposed to the “organized sounds” that the label is better known for. The two musicians keep delving deeper into the essence of music, delivering their little miniatures with an immediacy and authenticity which also characterized their latest albums. The effort makes the music of Nada go away from the long Coltrane-like expansiveness that Carrier used in his live performances, yet transforming the spirituality into the more compact form, somewhat analogous to the short Japanese “haiku” verses. The music is indeed not epic anymore, it’s poetry. Even in the wildest and most expressive pieces, lyricism and subtlety are omnipresent. There are moments when Carrier sounds like Dewey Redman, both in his warm tone and melodic phrasing, and Lambert is, well, himself, creative and light of touch. The shortness of the tracks also forces the two musicians to focus on the tunes’ essence: a feeling, a sound, a rhythm. Creating it, wondering at it, playing around it, and closing it. But each piece has a story to tell, giving impressions from nature, and expressing a reaction to it, whether serene, as in “Growing”, sad, as in “Tabula Rasa”, or distressed, as in “Transformation”, joyful, as in “Clouds” or “Unknown”. The sound itself is very organic, with notes and rhythms growing out of their predecessors, quite naturally, without pretence, without a clear plan, yet definitely part of the same piece, and beautifully. The sound of life. Again, a great album.